If you are a pet owner, you may notice that every year around spring your pet sheds excessively, more so than any other time of the year. This is because they are getting rid of their thick, winter coats in order to prepare for a thinner coat for summer. However, pets shed their fur coats during the fall season, as well. In fact, it is the opposite of what happens in the spring--the thinner, summer fur coat is shed to make room for the thicker, winter coat. While the fall shedding is minor in extent to the spring shedding, fur is still being shed, which means your home is covered in fur and pet dander. This poses a problem for members of the household that are allergic to pet dander, as well as visitors. Pet allergies occur in individuals with a hypersensitive immune system that reacts negatively to certain proteins found in the dander of animal hair or fur. It is the dander—tiny, microscopic flakes of dead skin--that clings to the hair that causes allergic reactions, rather than the hair itself. Minor symptoms include itching of the eyes and nose, watering of the eyes, a stuffed or runny nose, sneezing and facial swelling. More severe symptoms may develop, such as coughing and wheezing that ultimately leads to an asthma attack. There are many things pet owners can do to reduce pet dander throughout the home. First, during “shedding season,” adopt a regular and more frequent grooming schedule. Brush out your pet’s fur outdoors to reduce the amount of shedding indoors. How often you brush your pet should depend on the breed, so be sure to talk with your veterinarian. 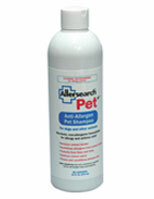 Pet owners should also wash their pets’ fur once a month with Allersearch Pet Shampoo. This fragrance-free shampoo is specifically made to remove pet dander from fur and continues to neutralize the allergens in pet dander that does appear for the next 30 days. Although the shampoo is fragrance-free, it works to remove odors that may build up in the animal’s fur. The shampoo is pH balanced, and does not contain any dyes, ammonites, or other potentially harmful chemicals. Instead, it is formed from plant and root extracts, for a more natural solution. When having guests over, pet owners should thoroughly clean the home and finish up by using an anti-allergen spray on furniture, countertops, carpets, etc. 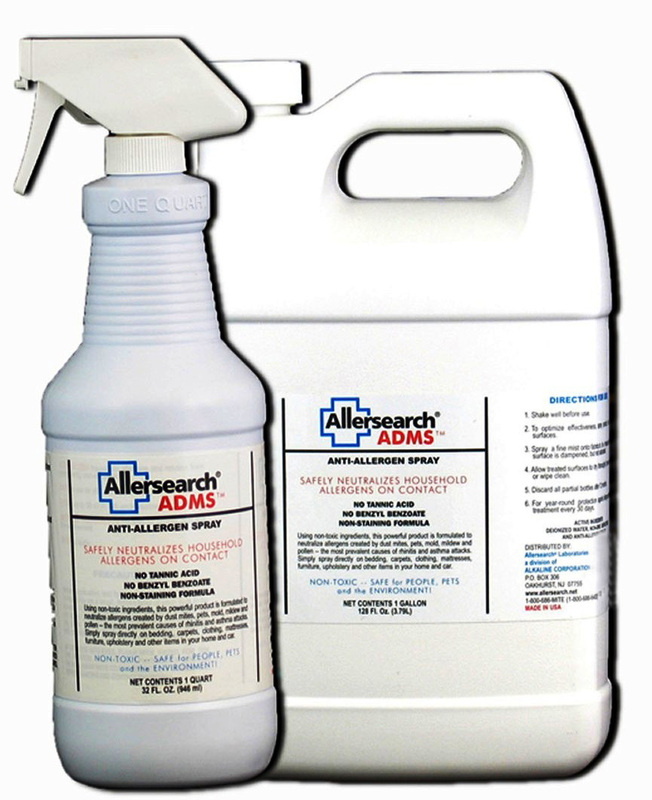 Anti-allergen sprays destroy allergens on the spot to prevent them from causing allergic reactions in individuals prone to certain allergens. 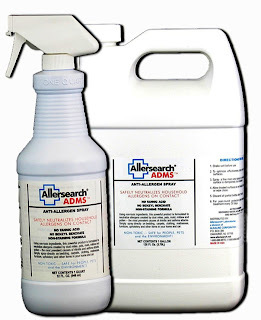 Other than pet allergens, the anti-allergen spray also works on pollens, mold and mildew and dust mites. Furthermore, when guests are spending the night, it helps to place a small air purifier in the bedroom they will be occupying to ensure the elimination of pet allergens. Air purifiers capture airborne allergens and immediately destroy them.